- Publisher Do you wish for more hours in the day? A shorter ?to do? list? Control in the midst of chaos? With insight and clarity, James C. Petty helps bring focus into frazzled lives. Using the ?Assessing My Priorities? worksheet, he walks us through the process of organizing time under the categories of God, the people of God, and God's work in the world. With sound biblical advice and practical application, this booklet demonstrates way in which we can reduce unnecessary stress, identify true priorities, and begin to get our overbooked schedules under control. 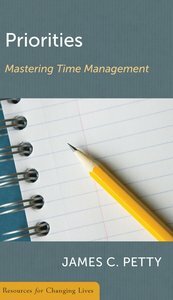 About "Priorities: Mastering Time Management (Resources For Changing Lives Series)"
Do you wish for more hours in the day? A shorter ?to do? list? Control in the midst of chaos? With insight and clarity, James C. Petty helps bring focus into frazzled lives. Using the ?Assessing My Priorities? worksheet, he walks us through the process of organizing time under the categories of God, the people of God, and God's work in the world. With sound biblical advice and practical application, this booklet demonstrates way in which we can reduce unnecessary stress, identify true priorities, and begin to get our overbooked schedules under control. Petty is counselor and Director of Development at the Christian Counseling and Educational Foundation, Glenside, Pennsylvania.